The Bucs’ former rock star general manager served up thoughts about his beloved team. 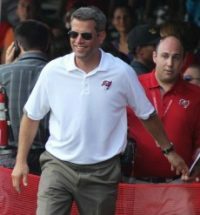 Yes, Mark Dominik remains a Bucs fan and he was chatting it up yesterday on local sports radio. 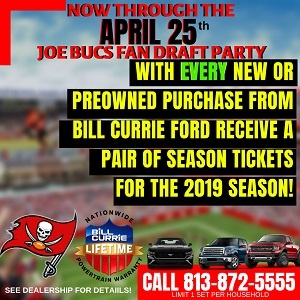 Joe realizes many fans are a little burned out on all the speculation at this point and just want to see the Bucs play a game, so Joe will summarize Dominik briefly. Dominik sees the talent overflow on the Bucs roster but also sees a loaded NFC and he knows all about the Bucs’ tough division. Tampa Bay’s supremely difficult schedule can’t just be brushed off as a typical year, Dominik said on WDAE-AM 620. Still, the talent infusion on the defensive line and the addition of two “long” rookie cornerbacks has Dominik bullish on the Bucs. Dominik sure loved those long corner during his time in Tampa. Unfortunately, Myron Lewis and Jonathan Banks didn’t work out. Dominik called the Bucs “a 9-7 type of football team” and believes a key to the season will be how well Ryan Fitzpatrick actually plays when the whistle blows. My prediction is 11-5.we go 1-2 in the first 3. Jameis becomes MVP and we drop out in conference championship. Corey Hart-lovin’ Bucs’ ex-GM wears his sunglasses at night so that he can predict the team’s win-loss record, but he wouldn’t know anything about “talent overflow”. Mark Dominick saddled the Bucs with multitudes of missed and under-performing draft picks…..Joe asks why Michael Bennett was let go for no good reason….ask Mark. Wonder why in the world we let Matt Bryant go…..ask Mark. So, when it comes to predictions on the Bucs season…..don’t ask Mark. Seems about right… sadly I could also see 6-10, especially depending on those first few games. Dominik is the primary reason the Bucs haven’t seen the playoffs for 10 years. His poor decisions, especially the way he used the cap on players like Michael Clayton, Quincy Black, trading premium picks for Revis and paying him $16 million when the Jets were going to cut him anyway, his drafts — letting Bennett go for peanuts because DuhQuan Bowers was anointed, etc. But he’s where he is now for a reason. The non-general-manager can harp empty proclamations from the sidelines. Its so funny that Joe still cannot admit that he was wrong on talk show dominik!!!!!!!!! Just a short 4 seasons ago, their was so much crowing of how “talented” the roster was, and how the coaches were holding back all that “scary” talent the talk show host accumulated!!!!!!!!!!! I guess history does repeat it self!!!!!! “hold them accountable” huh Sheep!!!!!!!!!!!!!!!! #trust the coaches!!!!! Fix the “real” problem!!!!!! The Roster!!!!!!!!!!!! Sounds like MD got into the liquor cabinet prior to this interview. I’m still trying to see how we can win 4 games this year. well, we all know how wrong dom always is….if he thinks we’ll have a winning record, that means the complete opposite will happen…..this could get ugly fast…..
New Orleans is just a single game…it’s on the road and we get them later at home…but to me it’s the single most important game of the first three. Obviously they are division rivals so games in effect count as two in the record…Pittsburgh is meaningless except for the W…Philly is in our conference and so will have slightly more importance. But N.O. is the win I want the most of the first three. If we beat N.O. on Sunday it really gives us a jump start…especially with the Falcon’s loss..in a very tough division. And of course psychologically it is critical. Are we really improved or are we going to see the same ole same ole? Can the team compete with Fitz or not? Why does anyone listen to this blabbering fool? He set our franchisee back a DECADE. Not even a grain of salt! LOL – How many of Dom’s draft picks DID “work out”? I count 3 and that’s including Gholston who is little more than a marginal back-up coming into his 6th year. Well if we weren’t doomed before this seals it. You know the more I think about it, a 9-7 record this year could be sufficient for a division title. All of the NFC south teams play all of the NFC East teams. Both Philly and Dallas can give teams problems, as evidenced last night as Atlanta loss to Philly. Dallas plays Carolina Sunday. Granted we have to play those teams as well, but given splits in the intra division games and a strong performance against the NFC east teams, there could be a chance of the BUCs coming out on top, particularly if we can win the game against the Saints this weekend. If Fitz can pick up just one win in the 3 he starts, let’s hope its this Sunday. Still no pass rush, grimes is hurt aid old, flex hargraves is well, hargraves. Another long season. Echase, hope you enjoy the game. With that attitude I don’t know why you even bother. Why are you people bucs fans? Is your sister tired of listening to you complain so you come on here to cry? No one wants to hear it. I hear Philly is looking for some more a-hole fans. See ya. This is almost exactly my prediction too. I take it a step further though. We face the Lions in the NFC Championship game. My reason for saying so? Blount. The Lions signed him and everywhere he goes he wins a superbowl. Recently. A troll by any other name is still a troll. Making new usernames does not change who you are. I want to beat the Saints for sure. Would be nice to beat the Eagles to help a tiebreaker against the Falcons later if needed.